Taking into consideration home field advantage is an essential part of betting. What factors influence home advantage? Which soccer league has the biggest home advantage? What do Pinnacle’s closing odds suggest about home field advantage? Read on to find out. There are a number of factors that are theorised to contribute to home field advantage to some degree and these have been outlined below. There is some evidence of home team bias when it comes to refereeing decisions. The change in penalties awarded since the introduction of VARto certain soccer leagues gives a good indication of this. Whilst penalties are fairly rare events that have a relatively limited impact on the overall home field advantage, the home team bias demonstrated since the introduction of VAR implies that referees could be favouring the home team when making other decisions within a match. 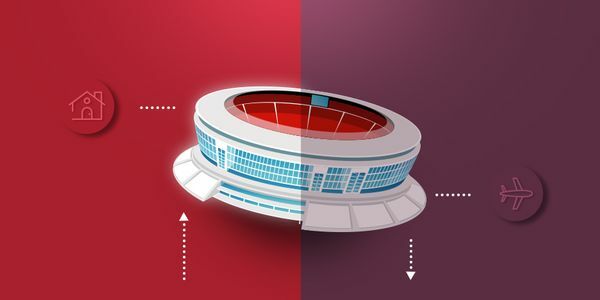 There is some evidence that a team’s familiarity with a venue can contribute to home field advantage but it may not be as significant as other variables. Logically teams that have to travel long distances may suffer a disadvantage compared to teams playing in their home stadium. However, the effect of travel on athletes has been studied extensively and results are inconclusive concerning whether air travel has a detrimental impact on performance. There have been various other potential contributors to home field advantage investigated including testosterone, altitude and extracurricular distractions. Dominic Cortis has provided an in-depth explanation for some of these other potential causes of home advantage in this article. Which soccer league has the biggest home field advantage? The level of home field advantage varies between leagues in soccer. Since each team plays their opponents both home and away it is relatively straight forward to measure home field advantage. The best way to do this is by looking at the average goal difference achieved by home sides (home goal advantage) as this will be a more accurate reflection of any potential advantage compared to simply looking at results. For example, by looking solely at match results, Manchester City beating Huddersfield by eight goals to one at home and then winning by a single goal in the reverse fixture would be counted as the same outcome. Home goal advantage demonstrates that Huddersfield performed better at home. As the table shows, the MLS is quite distinct from the big five European soccer leagues due to the level of home field advantage enjoyed by home teams. 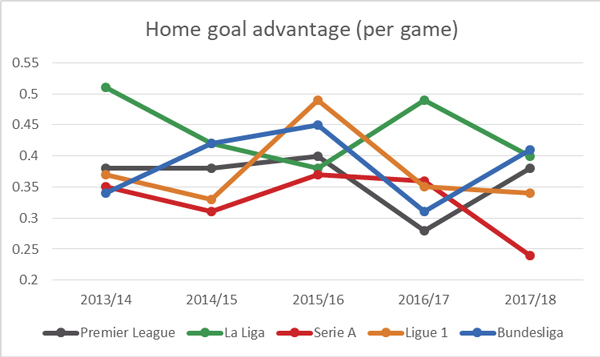 The big five European leagues are all relatively close with evidence of a marginally greater home field advantage present in Spain’s La Liga whilst the effect of home field advantage is diminished in Serie A. It is no secret to bettors that home field advantage exists in soccer but how inline is home goal advantage with the betting markets? 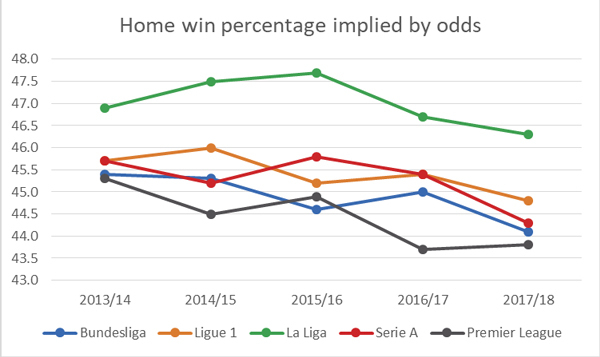 The table below shows the expected home win percentage implied by Pinnacle’s closing line odds, which correlate very strongly with actual match outcomes. The market agrees with La Liga’s stronger home field advantage but actually rates the Premier League as the league least friendly to home sides. However, the difference between the Premier League, Ligue 1 and the Bundesliga is marginal. There is only a moderate 0.46 coefficient of correlation between home goal advantage and Pinnacle’s closing line odds. There are two potential reasons for this. 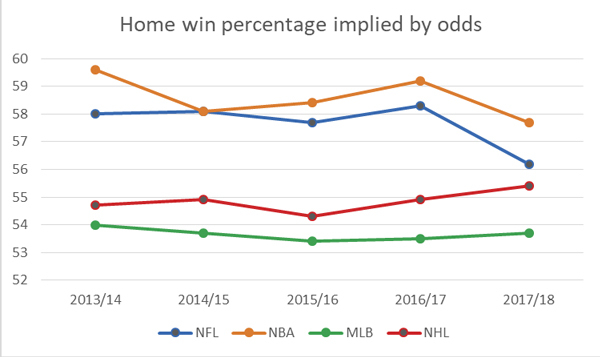 Home advantage is not particularly variable and the big swings in home goal advantage are due to variance correctly ignored by the closing line odds. Alternatively, the market is not efficiently calculating home advantage and lags behind the actual swings. Since the closing line odds are such efficient predictors in general, the answer is probably the former option. However, there may be some cases where the closing line odds are not completely factoring in home advantage. Home field advantage is also a factor in the major US sports. In fact, it is even more pronounced due to the removal of the draw result. Home court advantage is a much-discussed topic in the NBA and it is easy to see why. According to the closing line odds home teams are more dominant than in the other three major leagues. The NFL possesses a similar home advantage but sample size here is small since most teams play just eight home games per season. Interestingly, the MLB (where teams play the highest total number of games on the road) ranks the lowest in terms of home field advantage implied by the odds. What should bettors know about home field advantage? It is difficult to know how efficiently the market is pricing home field advantage. We are aware of its existence but the level to which it influences sporting fixtures is difficult to ascertain. To make things even more complicated, different teams and leagues feature contrasting levels of home field advantage which can also vary from season to season. Given how efficient the Pinnacle closing line is at predicting match outcomes the market does a good job at factoring in home field advantage. However, that does not mean that inefficiencies will not appear occasionally for enterprising bettors.